Description: The Fringed Myotis (Myotis thysanodes) is very recognizable do to a fringed of short hairs it has. It also has light brown fur and a white belly. 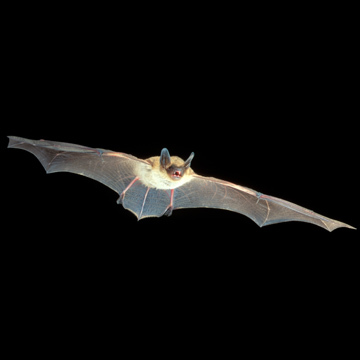 It’s average length is 85 mm and the approximate weight of this bat is 9 grams. About the Fringed Myotis: This migratory bat species can be found roosting in caves, old buildings, and mine tunnels. Maternity colonies can hold up to several hundred individuals and females give birth to one pup. Nothing is known about their hibernating patterns in Texas.